On this day in 1820, the popular belief that the tomato is poisonous was disproven, opening the way for western cultures to consume tomato sauce, gazpacho, salsa, and tomato sandwiches with abandon. The tomato, in fact, is native to South America, where it first grew in the highlands of Peru. One particular tomato species, Solanum lycopersicum, was transported to Mexico, where it was grown and eaten by Mesoamericans, among whom the Aztecs may have been the first to domesticate the fruit (though it’s often eaten as a vegetable, botanically-speaking, the tomato is a fruit). 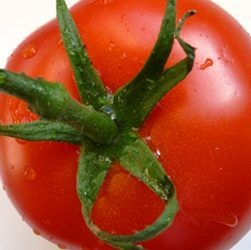 The word tomato comes from the Uto-Aztecan Nahuatl word, “tomatl,” which means “the swelling fruit.” Aztecs and other Mesoamerican civilisations used the fruit extensively in their cooking. Historians are unsure who first brought the tomato to Europe. Some believe Spanish explorer Cortes was the first to bring the tomato to Europe, after he captured the Aztec city of Tenochtitlan in 1521. But others believe Christopher Columbus may have taken tomatoes to Spain as early as 1493 after his discovery of the New World. Regardless of who first brought the plump red fruit to Europe, once it arrived, it spread like wildfire. The Spaniards spread the fruit throughout their colonies in the Caribbean, and then to the Philippines and southeast Asia, from whence it spread throughout the entire Asian continent. As the fruit flourished in Mediterranean climates, it also became popular in some European countries like Italy. Tomatoes reached England later, and when they did, they were thought to be poisonous. One the fruit’s earliest cultivators, a barber-surgeon by the name of John Gerard, believed they were poisonous because they contained low levels of the toxic chemical tomatine. Tomatoes do, in fact, contain low levels of this glycoalkaloid with fungicidal properties, but the levels are so low as not to be dangerous. Nonetheless, Gerard’s views caught on and for years tomatoes were considered unfit for consumption in England and its North American colonies. Fortunately for gourmands everywhere, a certain American by the name of Colonel Robert Gibbon didn’t believe the rumours. On 28 June 1820, at the height of the tomato season, he disproved the popular myth in a public demonstration on the courthouse steps of Salem, New Jersey, in which he ingested a tomato without incident. Americans, and soon Britons, began eating the juicy tomato in droves and it enjoyed a newfound popularity.